Guardian Prelude: HD Full Version is an amazing RPG from Cool It Studio. In ancient times, the evil forces of darkness came to our world from distant chaotic universes, everything becomes chaotic, elements and magic are no longer under control, and many creatures begin to mutate under the influence of dark forces. At this time, the Templar, the demon hunters, the magicians, the Sword Warrior, and Berserkers are united to defeat the Dark Monsters and save people from the shadow of death. However, there are more horrible dark forces waiting for them. Explore hidden story and mission,openful world game. 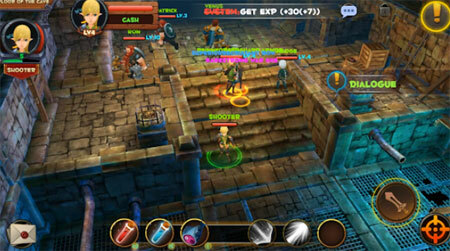 Team up with friends to explore dungeons and overcome BOSS together. If you get stuck in the game, check out the video walkthrough and gameplay for the game. This entry was posted in Android Games, iOS Games, Mobile Games, Walkthrough and tagged Guardian Prelude Cheats, Guardian Prelude Game, Guardian Prelude Gameplay, Guardian Prelude Guide, Guardian Prelude Hints, Guardian Prelude Review, Guardian Prelude Solutions, Guardian Prelude Strategy, Guardian Prelude Tips, Guardian Prelude Walkthrough by Marvin. Bookmark the permalink.